Last month, SpaceX CEO Elon Musk made a presentation before the International Astronautical Congress in Adelaide, Australia, a followup to his 2016 talk where he unveiled SpaceX’s Interplanetary Transport System and his ambitions to colonize Mars. This year’s presentation showcased some updates and design changes to his plans and the rocket itself — he wants to put all of SpaceX’s resources into the BFR, and use it to provide long-distance travel around planet Earth. On Saturday evening, Elon Musk hosted an Ask Me Anything session in r/space, where he answered questions about his the ITS, the engines that power it, and more. Another user asked about the heat shield, asking if it was mounted on the ship or embedded into the skin of the rocket, to which Musk said that they would be mounted to the primary tank wall. Finally, someone asked one of the big questions left unanswered by Musk’s 2016 talk: what about the threat of radiation for astronauts? Musk said that “Ambient radiation damage is not significant for our transit times,” and that the BFR would just “need a solar storm shelter, which is a small part of the ship.” He followed up by saying that Buzz Aldrin is 87, seemingly implying that his short trip to the moon and back left no lingering damage. In order to be able to land the BF Ship with an engine failure at the worst possible moment, you have to have multiple engines. The difficulty of deep throttling an engine increases in a non-linear way, so 2:1 is fairly easy, but a deep 5:1 is very hard. Granularity is also a big factor. If you just have two engines that do everything, the engine complexity is much higher and, if one fails, you’ve lost half your power. 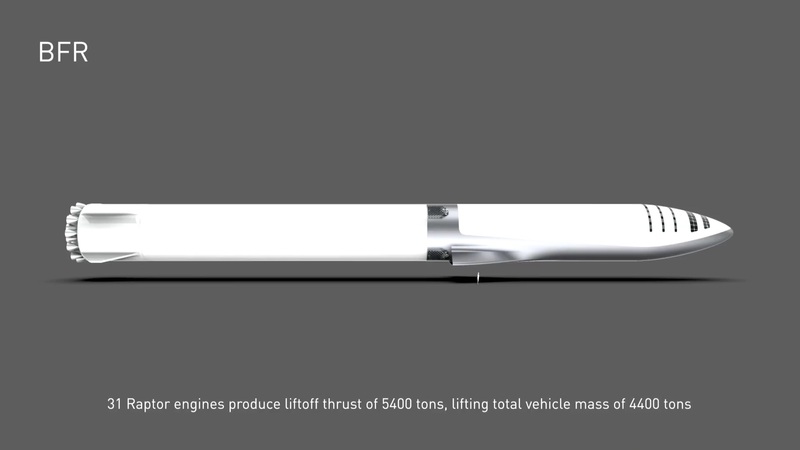 Btw, we modified the BFS design since IAC to add a third medium area ratio Raptor engine partly for that reason (lose only 1/3 thrust in engine out) and allow landings with higher payload mass for the Earth to Earth transport function. The flight engine design is much lighter and tighter, and is extremely focused on reliability. The objective If our engine is even close to a jet engine in reliability, has a flak shield to protect against a rapid unscheduled disassembly and we have more engines than the typical two of most airliners, then exceeding airline safety should be possible. 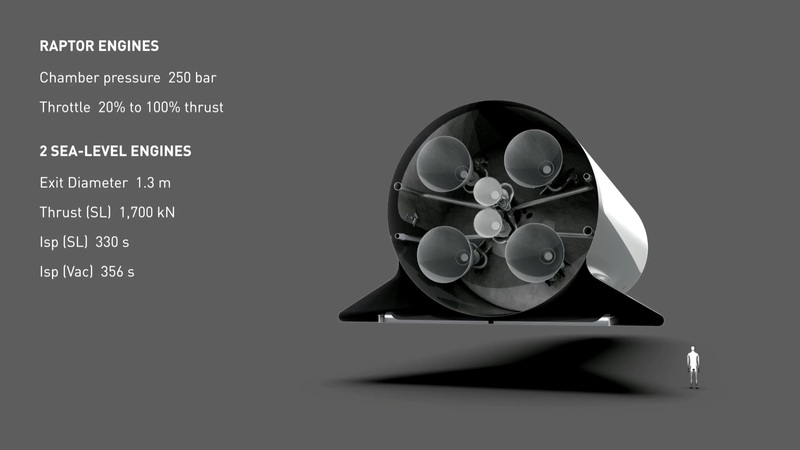 One detail Musk unveiled during his talk was that the BFR has two different types of Raptor engines: four that can operate in a vacuum, while two others are designed to operate at sea level. When asked if those vacuum engines could work at sea level in the case of an emergency, Musk replied that they could but that it wasn’t recommended. Another line of questions was about SpaceX’s ambitions on Mars, and how the company would set up infrastructure for its colonists. The first question was about whether or not SpaceX would put more satellites around the planet, or if the satellites in place would be sufficient. Musk answered yes, but it’s not clear what question he was answering. He also didn’t quite answer a question about specific landing sites for SpaceX’s base, saying only that the site needs to be in a “low altitude to maximize aero braking, be close to ice for propellant production and not have giant boulders.” He also noted that somewhere near the equator will be good for solar panels. 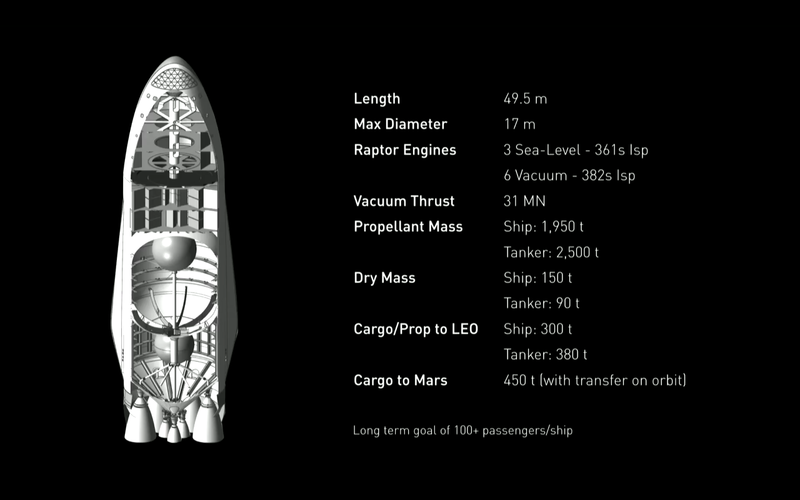 Musk did say that SpaceX will design the ISRU (in-situ-resource utilization) system designed to collect materials for propellant on Mars and that the design is pretty far along. Someone also asked if they’ll transport one of the boring machines that Musk has been using with his Boring Company, to use to mine ice or build tunnels. Musk only replied “more boring!,” so take that as you will. 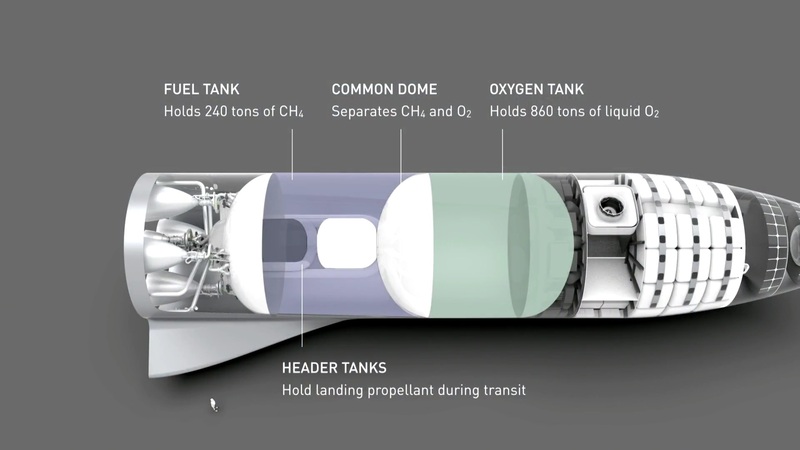 Another big question about SpaceX’s Mars plans have been how the company would keep a colony supplied: one user asked “what companies are you working with to provide the technology that SpaceX isn’t focused on?” Musk didn’t really provide any details on the first two points, but did lay out that their “goal is get you there and ensure the basic infrastructure for propellant production and survival is in place,” comparing it to the development of the transcontinental railway. Importantly, he noted that industry on Mars would “need to be built on Mars by many other companies and millions of people.” It looks as though Musk will have to get help from other companies to realize his vision of a self-sustaining colony. Finally, Musk answered a questions about the preparations to get to Mars. One was about what to expect between now and 2022: would SpaceX perform hop tests with the BFR, build new facilities, and test out propellant? “Yes, yes, and yes,” was his reply. Gadget Lab Podcast: Can Tech Help Me Sleep Better?